In 2013 and 2014, two symposia featured faculty and student research supported by GSU Research grants. In 2016, the Governors State University Research Day was established, featuring faculty and student research in the form of paper presentations, panel discussions, and poster sessions on the GSU campus, University Park, Illinois. The office of the provost initiated the undergraduate research program (URP) this academic year to enhance research activities among undergraduate students at GSU. The program has several features which help faculty members motivate students to engage in quality research, and encourages undergraduate students directly to build strong foundations through which they can be successful in conducting research. The program has recognized that quite a few undergraduate students yearn for academic excellence and want to satisfy their intellectual curiosity. They seek faculty members to become their mentors and are willing to work very hard to achieve successful results in research. Faculty members on the other hand are also seeking to have such diligent students and are eager to make them excellent scholars. This pursuit of excellence from both sides culminates into a strong bond between the faculty and students. The role of URP is to be a catalyst to strengthen this teacher-disciple bond by creating an environment through which there is a maximum beneficial interaction and collaboration between faculty and students. Though URP is in its infancy, it has founded several programs which will benefit undergraduate students for years to come. URP has established a research grant for exclusive use for the undergraduate research. This year eight faulty members received the grant and they have engaged several students in the research activities. URP has received seven more grant applications for the next year. Several student workshops directly related to research have been offered. Through these workshops students have enhanced their skills in literature search, writing laboratory notebooks, writing research reports, and presentations of their research work. URP also has travel funds for students to present their research work in professional conferences. The undergraduate research program has successfully initiated an Undergraduate Research Club to promote camaraderie among undergraduate researchers. It has proved to be quite successful and highly motivating for students to join in research. The club, with highly enthusiastic members, has been quite active in recruiting students and promoting URP's mission of engaging undergraduate students in research and scholarly activities. The club took active part in the Inaugural Meeting of Undergraduate Research Program on November 26, 2013. One of the goals of the club is to attract freshman students starting in Fall 2014, and actively recruit lower division students throughout the year. Another mission of URP is to prepare undergraduate students in presenting their research work in professional conferences. Besides the Power Point and oral presentation workshops, URP has established two main events, one in the middle of the year and one at the end of the academic year, where student will have opportunities to present their research work, and hone their presentation skills and get prepared for the professional conferences. All students who benefit from the URP grants are required to present their work at the end of the year research symposium. 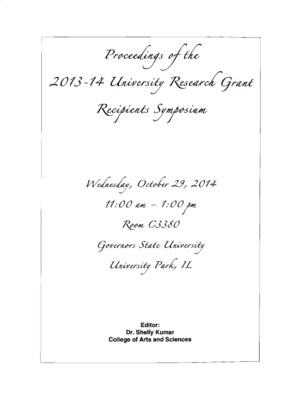 Today we are celebrating the very first undergraduate research symposium at GSU. This event represents the culmination of the hard work through which successful research has been achieved. Today you will proudly present your results, through which you have addressed the answers to the mysteries you were seeking. Hopefully, in this process you have discovered more questions which need to be answered, as research is a never-ending pursuit of knowledge and truth. So, enjoy the day, share your excitement, teach others, learn from others, and make friends. 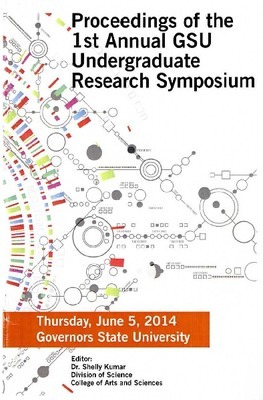 Faculty who received University Research Grant support were presenters at this 2014 program. In 2016, the Governors State University Research Day was established, bringing together student and faculty research.